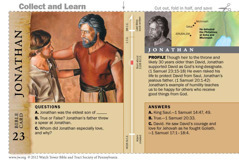 Download this Bible character card and learn about Jonathan. Cut out, fold in half, and save. When Saul began ruling as the first king of Israel, he was humble. God answered her specific prayer. He was the father of one of the strongest men who ever lived.